The traditional Bavarian lederhosen is a classic, whether with or without suspenders - that is of course a matter of taste. 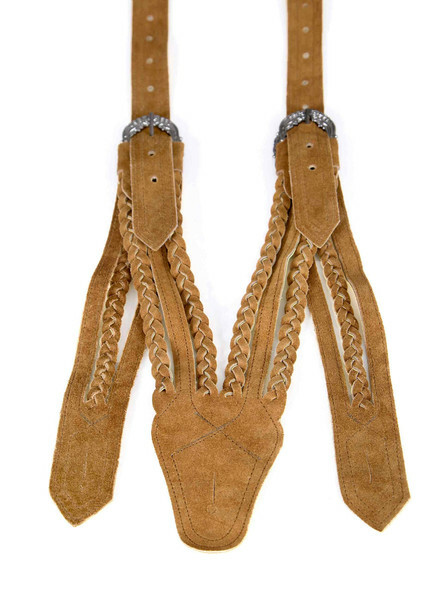 For all fans of traditional costumes, ladies as well as men, who appreciate a chic pair of German leather suspenders, we have the right thing here: straps made of the finest leather, with traditional details and rustic metal buckles. 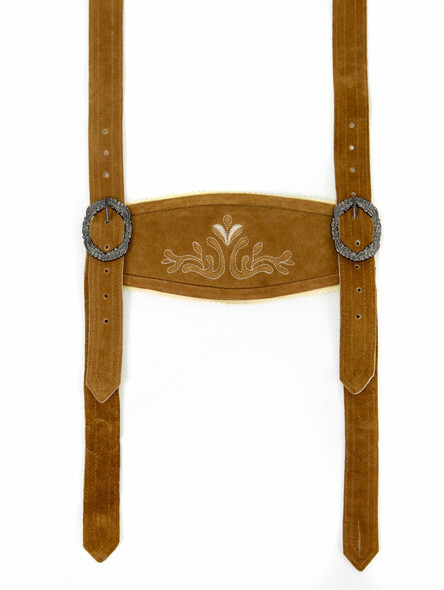 The typical H-shaped lederhosen suspenders are standard on most of our traditional lederhosen for men. On the front is the classic bib (also called bridge) with straight straps. On the back, the suspenders can be worn straight or in a classic crosswise fashion, depending on your preference (this is what the supplied loop is for). Ready for a change? 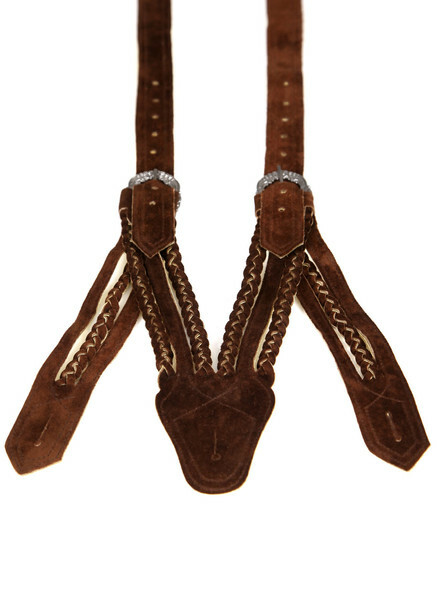 You?ll get this with the Norwegian suspenders in an ingenious V-shape. But note: Norwegians are only worn with knee breeches! The five-point fixation makes them ideal for particularly heavy lederhosen. All men?s lederhosen with German suspenders have four visible buttons at the front and two at the back. Classic H-shaped straps are hooked into the outer buttons on the front and buttoned into the two remaining buttons on the back. The fixing of the lederhosen?s braces in Norwegian style is slightly different: the middle button strap is buttoned at the front into the hidden button behind the trousers? flab which also closes the trousers. Whether as a replacement or additional accessory, whether in brown or black ? 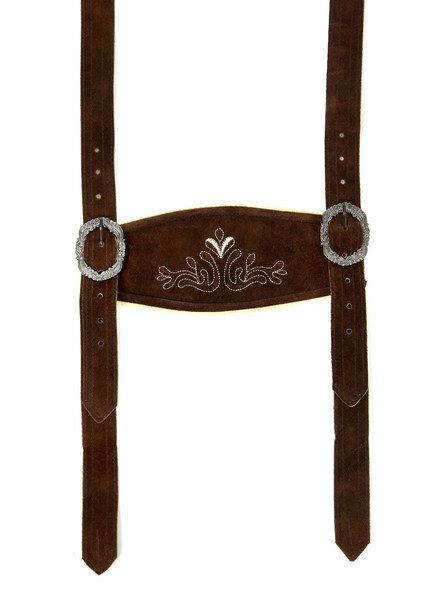 your Oktoberfest outfit gets completed with a smart pair of suspenders. 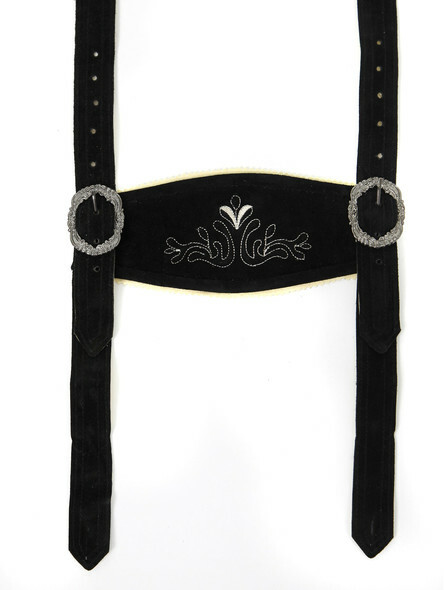 Insider knowledge: The embroidery on the bib of H-shaped suspenders has a long tradition in Bavarian fashion. In former times the ornamental decorations were regarded as a kind of identification for the local costume clubs. Thus, each region had its individual recognition factor on the lederhosen.